Dubai: Emirates will continue to carefully manage its costs over the coming years even as it eyes more investments and growth, the airline’s chairman said as its first-half profits more than doubled. Emirates reported its financial results for the first half of the 2017-2018 financial year ended September 30, 2017. Net profits saw a sharp 111 per cent jump to Dh1.7 billion compared to Dh786 million in the first half of last year. Revenues increased 6 per cent to Dh44.5 billion from Dh41.9 billion from the earlier year period. “Moving forward, we will continue to keep a careful eye on costs while investing to grow our business and provide our customers with world-class products and services. Our margins continue to face strong downward pressure from increased competition, oil prices have risen and we still face weak economic and uncertain political realities in many parts of the world,” said Shaikh Ahmad Bin Saeed Al Maktoum, President of Dubai Civil Aviation and Chairman and CEO of Emirates airline and Group. The airline carried 29.2 million passengers between April 1 and September 30, up 4 per cent over the same period last year. Analysts also agreed with Shaikh Ahmad’s views on the airline’s outlook, which remains marred by challenges. “I think the year and the industry environment are still quite challenging. We’ve got a backdrop of numerous geopolitical uncertainties around the globe that all airlines have to navigate. We’ve also seen fuel prices starting to rise, so if an airline is passive in that environment, it’s only going to one way, which is deep in the red,” said John Strickland, aviation expert and director of air transport consultancy JLS Consulting. He pointed out, however, that Emirates has taken action earlier this year of cutting capacity on certain US routes and elsewhere as a result of lower demand. Less visibly, the airline is restructuring internally to raise efficiency, Strickland said, adding that Emirates is a well-established company, and a well-respected brand, with a modern fleet. “We await this weekend (at the Dubai Air Show) and see whether there’s news of further fleet renewal, potentially to include orders for a more efficient version of the A380, but the [outlook] is certainly [for] continued investment in state-of-the-art aircraft, which offer better unit operating costs and allow maximum network flexibility,” he said. In its statement on Thursday, Emirates said its operating costs grew 4 per cent, as fuel costs were 14 per cent higher year-on-year. 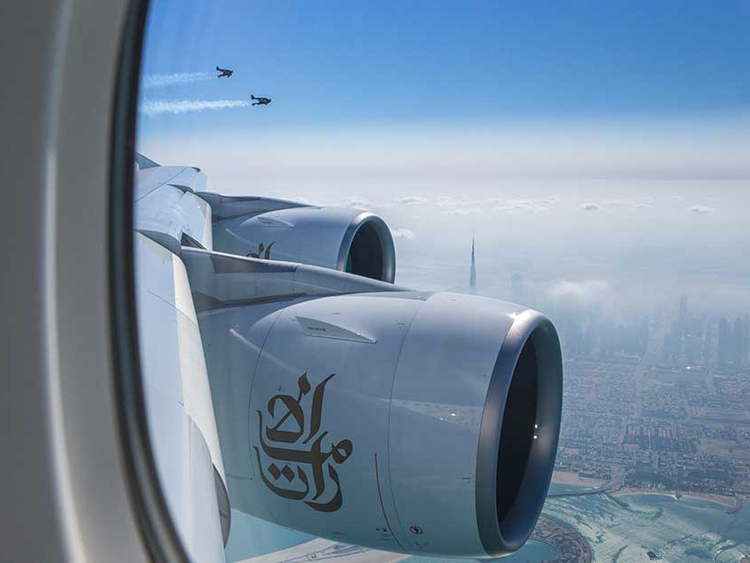 This was largely due to an increase in oil prices as well as an increase in fuel volumes due to Emirates’ expanding fleet. Fuel remained the largest component of the airline’s costs, accounting for 26 per cent of operating costs, Emirates said. From an operational perspective, Emirates received 10 aircraft — four Airbus A380s and six Boeing 777s — in the first half of the year, with nine more aircraft scheduled for delivery before the end of this financial year. It also retired five aircraft from its fleet, with another four to be returned by March 31, 2018. Its total fleet stands at 264 aircraft including freighters. Emirates launched two new routes to Zagreb (Croatia) and Phnom Penh (Cambodia), with the carrier serving a total of 156 destinations in 84 countries as of September 30. In July, the airline announced a partnership with flydubai in a deal that will see the two code-share and collaborate on networks. Emirates also announced in late August it will extend its partnership with Qantas for another five years.